Spectacular NYC views, huge terrace! You'll be on top of the world in this lovely one-bedroom set high in the sky with panoramic city and river views from each room! A big picture window in the living room is your 24/7 "living cityscape" and a 28-foot private terrace is your perfect perch for serving coffee or cocktails while gazing at neverending Hudson River happenings. Beautiful natural cherry hardwood flooring graces the entry and living area; brand-new complementary patterned tile in bedroom completes the warm and cozy look. Separate kitchen provides a private work area, or -- remove the privacy walls and design your own wide-open "great room" for collaborative serving and entertaining. Unbeatable view, unbeatable value - prices are going up, up, up! NYC Skyline from every room! A spectacular wall of floor-to-ceiling windows looks out onto the entire Manhattan skyline, from iconic midtown skyscrapers to the Freedom Tower, New York Harbor and beyond. This huge, sunny, fully renovated corner unit has dramatic black granite and hardwood floors, an expansive living/dining room and custom French doors opening onto a delightful guest bedroom adding to the overall feeling of light and space. 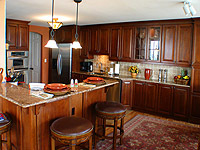 One of a kind custom kitchen features rich cherry wood and glass cabinets and stainless appliances. Wake up to spectacular city sunrises from your king-size master bedroom; find room for everything with seven customized closets, including an enlarged walk-in with built-in shelving and space-saving hidden pocket doors. Both bathrooms have all-new tile and glass. Elegant furnishings can be included in the price. Simply stunning! The view gets no better than this! This ultra high floor, rare dead-center unit enjoys complete privacy and direct, unobstructed views of the entire Manhattan skyline. You'll have 24/7 access to stunning sunrises, tranquil twilight, glittering NYC lights and panoramic Hudson River action from your 28-foot wall of floor-to-ceiling windows. Entertaining is easy with open U-shaped kitchen featuring gleaming white Caesarstone waterfall counter/breakfast bar, custom bamboo and crystal white glass cabinets, and all glass backsplashes. Stainless appliances include below-counter drawer microwave, counter-depth LG French Door refrigerator, built-in GE Profile convection oven, chimney-style range hood and built-in glass cooktop. Natural wood plank flooring graces throughout in warm chocolate pecan; closet doors are custom sliding glass and HVAC units are all upgraded. The expansive living room has cozy Dimplex electric fireplace, bathroom features Italian porcelain tile and hi-tech frameless glass shower. Picture-postcard New York City view! Step into your oasis in the sky, with stunning views of the Empire State Building, Hudson River, and entire Manhattan skyline; take it all in on your huge, 28-foot private terrace! This nicely appointed, high floor unit has oak hardwood floors throughout, wood paneled doors, upgraded double pane windows, updated kitchen with stainless appliances and breakfast bar, and new tiled bath with glass shower. Stunning NYC Views, GWB to Verrazano! Spacious and sunny, this extra-large corner unit has breathtaking panoramic views of the entire NYC skyline from the George Washington Bridge to the Verrazano. Enjoy it all, from glorious sunrise to tranquil twilight in your spacious living room, separate dining area, and enclosed terrace with 28-foot wall of floor-to-ceiling windows. Apartment has beautiful new kitchen, large entry foyer, hardwood floors, seven closets, extra-large master bedroom with two walk-in closets, and two renovated bathrooms. 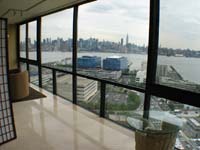 Big unit, spectacular NYC views! Great space, plus breathtaking views of the entire NYC skyline! 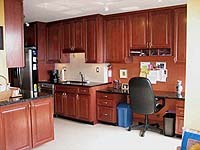 A roomy 820 square feet including separate small room suitable for home office, nursery, or guest room. 28-foot wall of floor-to-ceiling windows provides 24/7 enjoyment of the entire New York City skyline and non-stop river action. Updated kitchen and bathroom; wood floors in living area; tiled kitchen, foyer, and enclosed terrace areas. Plenty of storage with enlarged bedroom closet. Great value! (Please call for important information about this listing). Nicely updated, wall of windows, direct Empire State Building View! 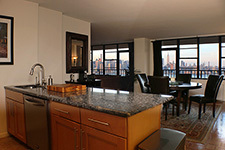 Come home to breathtaking Manhattan skyline and Hudson River views from your dramatic wall of floor-to-ceiling windows. This bright and spacious apartment has been fully updated with Euro-style kitchen featuring aluminum and frosted glass cabinets, full glass backsplash, stainless steel appliances, and ample double-tiered black matte counter tops. 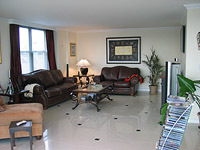 Bedroom and living room are quietly carpeted; kitchen and foyer have bright and crisp ceramic tile. Mirrored wall and closet doors reflect light and space for a look and feel that's clean and serene, from sunlight to twilight. Heavenly! (Note, this property is a short sale; contact listing agent for details). Incredible deal! Great starter apartment or pied-a-terre! Excellent opportunity to get into this full-service building at rock bottom price! This bright and roomy apartment is flooded with sunlight and has endless closet space. 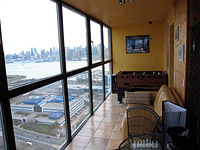 Conveniently located just one flight up in lovely Troy Towers, you will be perched on a 20-story cliff overlooking Hoboken, the Hudson River, downtown Manhattan and the Jersey City skyline. Enjoy beautiful sunsets from your private 25-foot south-facing terrace. Add a little TLC and live like a king! Huge terrace, glass doors, drop dead NYC views! 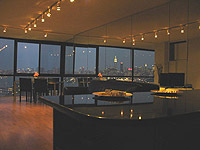 Glorious NYC skyline panoramas are in constant view through a wall of glass and giant terrace to take it all in! This lovely apartment has hardwood oak floors throughout living area, updated kitchen with tile counter/breakfast bar with decorative metallic insets, mosaic finishes, wine refrigerator and pretty pendant lighting. Roomy bedroom has mirrored double closet; updated tiled bath has stylish chrome/glass sink and glass mosaic floor and trim. City glitter, river views, down-to-earth charm! This extra-large unit has private entry foyer, big living/dining room, bright modern kitchen with elegant maple block storage island, king-size bedroom and endless closet space. Enjoy your huge terrace for lazy soirees, cruiseship gazing, dramatic dawns and serene sunsets. Apartment has all new windows, wood and tile floors throughout, updated kitchen and bath, elegant frosted glass and wood-framed closet doors, built-in china closet and charming Tiffany-inspired pendant lights. Great value! 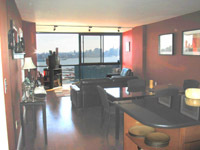 Rare opportunity - huge 2BR with opposite-end bedroom suites, giant balcony, direct unobstructed NYC views! Two direct east-facing one-bedroom units have been conjoined to create an extra spacious apartment with private bedroom suites at opposite ends and plenty of room for formal dining plus a home office area. 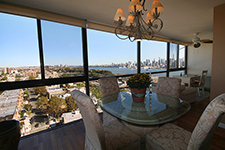 Twenty-six linear feet of windows provide breathtaking panoramas of the entire Manhattan skyline and Hudson River to the Verrazano Bridge and beyond. Apartment has new kitchen with wood cabinets, granite counters, and stainless steel appliances. 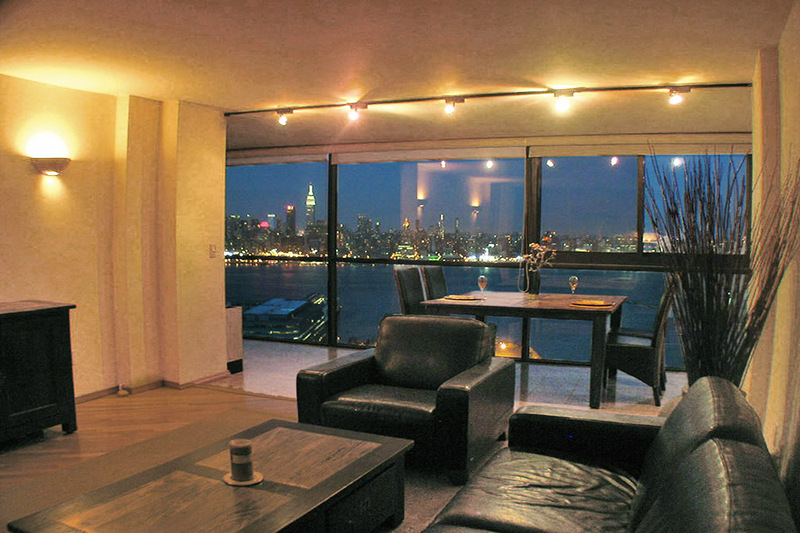 Bring your designer touch; create a one-of-a-kind home on the Hudson with Empire State Building views from every room! This beautiful apartment has room to spare, with 940 square feet of serene style and lots of light, reflected in dramatic 32-foot wall of mirrors. All-new terrace enclosure has floor to ceiling double pane windows providing 24/7 enjoyment of spectacular river and City views from the Empire State Building to the George Washington Bridge and beyond. Apartment has new stainless and granite kitchen, beautiful new all-marble bath with glass shower, all new high-efficiency HVAC units and new wood laminate floors throughout. Separate dining area and enormous living room make for great entertaining. King-size bedroom and ample foyer/hallway have custom mirrored closets everywhere. Can be converted into a two-bedroom if desired. 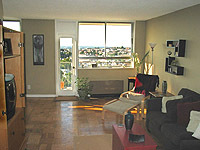 Huge 1-bedroom, dining alcove, bright & sunny! This giant one-bedroom, the largest in Troy Towers, gives you loads of closet space and room to roam. Enjoy your morning coffee or cocktails at sunset from your all-glass sun room with wide open views of city lights and lush greenery. Wood parquet tile floors throughout, newer windows, quiet and bright. Can be converted to a small 2-bedroom if needed. Excellent Value! Troy Towers - Apt. 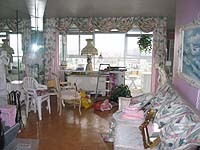 1702 "Before"
High floor, gorgeous views - create your palace high in the sky! This diamond in the rough is the largest layout in Troy Towers, with five closets and giant L-shaped living room/dining room that could be converted to second bedroom. Mirrored walls reflect beautiful Empire State Building, Hudson River, uptown Manhattan and GW Bridge views. Enclosed terrace can be used as sunroom, spruced up to become additional sitting or dining area, or opened up to create giant loft-like living space. Good bones, good value, great potential! Troy Towers - Apt. 1702 "After"
The largest 1BR layout in Troy Towers, this huge, beautiful "junior 4" apartment has been modified to create a small second bedroom, with removable walls to easily re-claim extra living space if desired. Terrace has been enclosed, allowing for large separate dining area and spectacular floor-to-ceiling views of Empire State Building, upper Manhattan, GW Bridge & distant mountain vistas. Apartment has modern granite kitchen & new bathroom, hardwood floors throughout, new windows & AC units, extra-large living room, and closets everywhere. Great opportunity! Troy Towers - Apt. 1702 "Later"
The largest 1BR layout in Troy Towers, this huge, beautiful "junior 4" apartment has plenty of room to roam, or convert part of the space into a home office, nursery, or guest area. Terrace has been enclosed and tiled, allowing for large separate dining or lounge area with spectacular floor-to-ceiling views of Empire State Building, upper Manhattan, GW Bridge and distant mountain vistas. Apartment has modern granite kitchen, new bathroom, crown moldings, hardwood floors throughout, new windows and A/C units, extra-large living room and closets everywhere. Great opportunity! Extra-large, extra sunny, huge terrace! 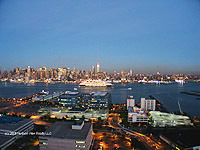 Lavish in brilliant southern light and panoramic NY harbor, Jersey City and downtown Manhattan views from this extra-large 1 bedroom, 1 bath apartment with endless closet space. Apartment features wood frame double-pane windows, large working kitchen with breakfast bar, updated bathroom, and huge private terrace to enjoy spectacular sunsets cocktails as fresco. Terrace can be enclosed to add 180 square feet to this 775 square foot space. Great potential; bring your designer touch! 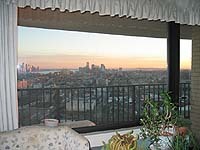 Huge unit, high floor, stunning sunset views! 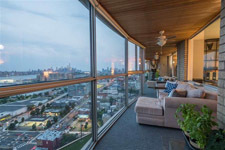 Great opportunity to own a giant 1-bedroom in fabulous Troy Tower, with private balcony and panoramic views of downtown Manhattan, Jersey City skyline, New York Harbor and sweeping Garden State vistas. This ultra-sunny, sky-high unit has entry foyer, separate dining area, huge living room, king-size bedroom, and tons of closets. All new windows set the stage for your creative touch; incredible potential! 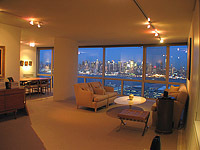 Come home to breathtaking views and quiet serenity, with the iconic New York City skyline as your ever-evolving mural. 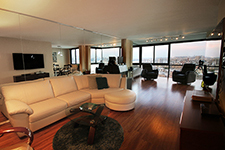 This unit is spacious and bright with wall of mirrors and huge glass-paneled terrace. Large renovated U-shaped kitchen has warm granite peninsula, wood cabinets, quality stainless appliances and pretty pendant lights to set the mood. Crisp tile floors throughout provide a clean and airy look; modern tiled bathroom has European glass shower. Bedroom is fit for a king with glittering City views and mirrored closet doors. Spectacular NYC views; big terrace! Extra-large unit, huge terrace, sunset view! This extra-large apartment has breathtaking 270-degree views from its 25' corner terrace. Enjoy bright southern exposure, spectacular sunsets, and picture-perfect city, river, and mountain panoramas. Apartment has updated large kitchen and six oversized closets. Call for appointment! Fabulous NYC view! Huge terrace! 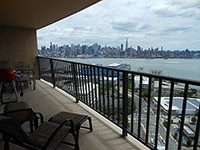 Enjoy balmy breezes, 4th of July fireworks, and ever-changing Hudson River action from your huge terrace directly facing the magnificent New York City skyline. This bright and charming one-bedroom has wall of windows with sliding glass doors, four closets, upgraded kitchen with beautiful granite counter and stylish pendant lights. Lovely new tiled bathroom and bright, plush new berber carpeting throughout. Move right in! 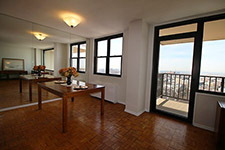 Gorgeous, sunny, wraparound NYC views, terrace! Rare opportunity - one of the largest and most desirable layouts in Troy Towers, with dramatic wall of glass plus huge tiled, glass-paneled terrace. 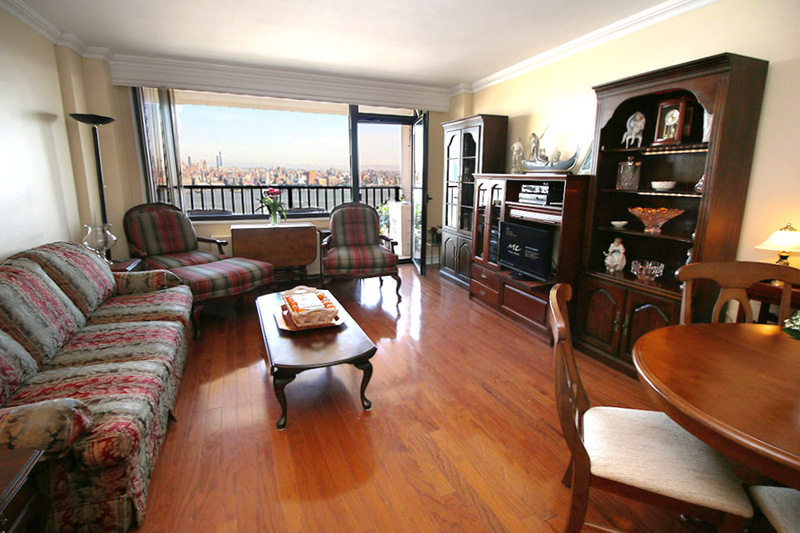 Enjoy panoramic views of the Empire State Building, Freedom Tower, NY Harbor and beyond. Apartment has large L-shaped living room/dining area; kitchen has maple Shaker-styled lighted cabinets, stainless GE Profile appliances and granite counters. Two new marble baths have frameless glass showers and custom tile trim. Gleaming porcelain tile floors, all new windows and new AC units throughout, custom closets everywhere. Master suite has beautiful marble dressing room with cherry cabinets. Unique and stylish architect-designed apartment, wall of floor-to-ceiling windows with custom solar shades, panoramic City and river views. Separate dining area, enlarged second bedroom with wall to wall closet with built in shelves. All new travertine tile floors throughout huge living area. Chic angled kitchen plays upon geometric shapes while offering generous stainless steel counters, double stainless oven, custom range, in-cabinet dishwasher, twin circular stainless sinks, and endless mirror-like lacquer cabinets with custom back splash. Apt. has two new tiled bathrooms, seven closets with built ins, custom lighting, custom blinds, hidden wiring throughout. Spectacluar NYC views, bonus alcove! Enjoy the best of both worlds with glittering city lights and the warmth of a "home." This large and lovely 1BR has a breezy island feel, with terra cotta tile floor throughout, new bathroom, and beautiful U-shaped granite kitchen with wood cabinets, breakfast bar with extra storage, and lots of counter space. Bonus alcove off large master bedroom is perfect for home office or mini-den. Floor-to-ceiling windows showcase the million dollar NYC skyline. Bright and beautiful; stunning NYC view! Relax with a cool drink on your cozy tiled terrace and enjoy peaceful river happenings as the spectacular New York City skyline looms from dramatic dawn to tranquil twilight. This immaculate unit has been graced with bright southeastern light and sparkles with luminous marble floors throughout the living area. Apartment has updated kitchen with white lacquer cabinets and striking black granite; bathroom has stylish mosaic tile, glass shower, porcelain vessel sink over white granite vanity, and built-in wall radio; bedroom has warm wood parquet floor and custom lighting. Direct Empire State Building view! Beautiful unit, crazy NYC view! 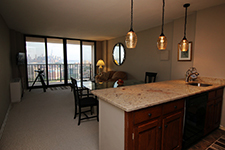 Beautiful unit, unobstructed NYC view! This bright, sunny unit has huge terrace with panoramic views of the entire Manhattan skyline and Hudson River. 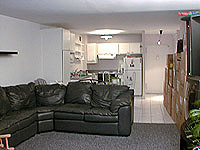 Enlarged renovated kitchen has maple wood cabinets, stainless appliances and lovely granite counters with breakfast bar. Living area has bright ceramic tiled floor, warm oak hardwood in the bedroom. Renovated bath, giant double pane picture windows, new AC units. EZ NY trans. Breathtaking views, huge, beautiful unit! Enjoy panoramic NYC, George Washington Bridge, river, reservoir and mountain views from every sunrise to sunset. Dramatic wrap-around wall of floor-ceiling windows, granite & tile living area, wood in bedroom; mirrored closets everywhere! Apt has spacious living room with separate dining area, enclosed terrace alcove that can be used for home office or guest sleeping area, custom lighting, large upgraded kitchen and lovely new tile bath. ALL utilities & basic cable TV are included! Quiet neighborhood, EZ commute. Troy Towers - Apt. 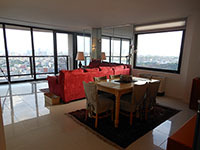 1513 "Before"
Enjoy magnificent New York City skyline and panoramic harbor views from your huge, private terrace in this sprawling 2BR, 2Bth coop in a well-run, luxury hi-rise building with concierge, pool, garage, gym, and easy public transportation. This 1250 sq. ft. gem offers full eastern and southern exposure, loads of closet space, and a quiet neighborhood setting just minutes from the Lincoln Tunnel. Troy Towers - Apt. 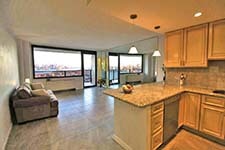 1513 "After"
Panoramic NYC views, big open terrace! Here’s the “wow” you’ve been waiting for! 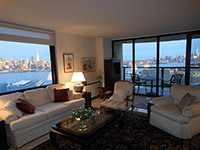 Magnificent NYC skyline plus panoramic Garden State vistas from the Empire State building to the Freedom Tower, Lady Liberty and beyond; enjoy every stunning sunrise to serene sunset with dramatic floor-to-ceiling wall of windows AND large private glass-paneled balcony. This high-floor, sun-flooded corner unit has gleaming white porcelain tile floors, polished wood parquet in bedrooms, new granite kitchen with wine cooler, all new A/C units, two new tile/marble baths, hidden wiring, lots of closets! Bright and spacious, direct skyline view! This is your window on the world! 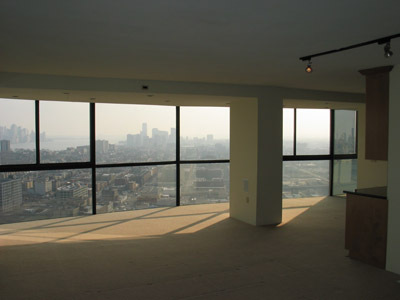 Stunning floor-to-ceiling windows accent the panoramic NYC skyline view. This extra-large unit has been renovated with updated kitchen and bath, recessed accent lighting, oak wood floors and ceramic tile in kitchen and foyer. This elegant, high floor renovated beauty is strategically situated dead-center in the arc of the building, offering total privacy and 100% unobstructed, panoramic NYC skyline views. Open sun room/dining area is lined with gleaming granite along dramatic 28-foot wall of floor-to-ceiling windows. Diagonal golden oak strip flooring in living room, kitchen, foyer and hallway add warmth and charm; whimsical black & white subway tiling in bathroom lend a touch of urban flair. Renovated kitchen features high-end stainless steel appliances, maple wood cabinets, and deep charcoal Corian countertops. All new closet and bedroom doors are elegant mahogany, new AC units, new baseboard moldings, overhead track lighting and wall sconces with hidden wiring all throughout. 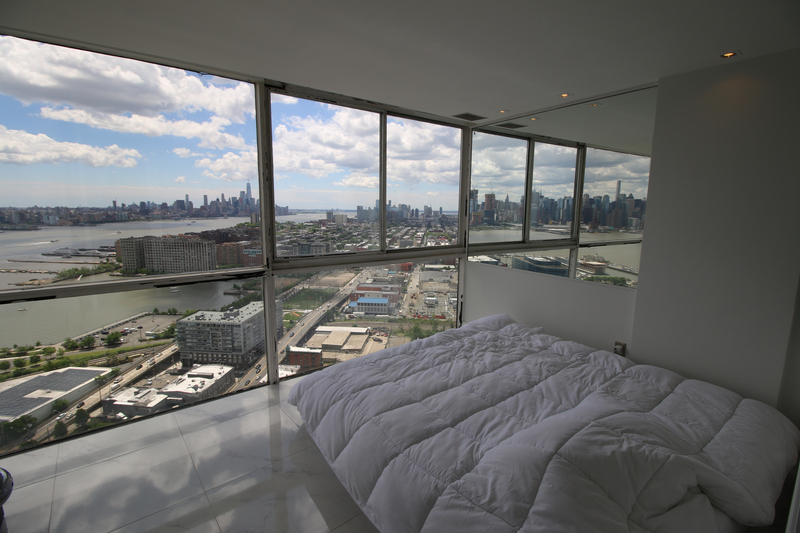 Million-Dollar NYC Views, huge, elegant! It doesn't get any better than this. Huge, beautiful, sun-flooded, this corner unit has breathtaking panoramic views of the entire NYC skyline from the George Washington Bridge to the Verrazano, from glorious sunrise to tranquil twilight. 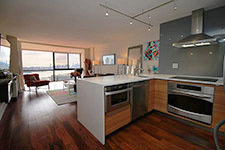 Large modern eat-in kitchen has high-end European appliances including Bosch SS dishwasher and Sub-Zero refrigerator. Apartment has large marble foyer, separate dining area, seven closets, extra-large master bedroom with two walk-in closets, and two marble baths. Giant sun-filled unit, fully renovated! 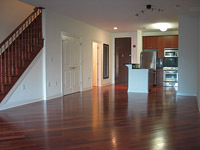 Beautifully renovated, this is the largest 1BR layout in luxurious Troy Towers. Terrace has been enclosed to create additional year-round sunroom/solarium in already huge living area. 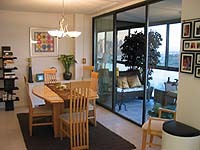 Perfect for lounging, dining, or just enjoying the fabulous sunsets and wide open river/city views. Dramatic dark bamboo wood floors gleam throughout, king-size bedroom, loads of closets, and lovely modern kitchen and bath add up to an incredible value. Immaculate, move-in condition! Amazing Manhattan skyline views, huge terrace! Wake up to glorious sunrises, sip cool drinks by tranquil twilight on your giant terrace while enjoying panoramic NYC skyline and river vistas. This pristine 1BR has brand-new granite and SS kitchen, newly renovated tile bath, gleaming wood parquet floors throughout, four closets, and giant picture window framing the magnificent Manhattan skyline. What could be more perfect? 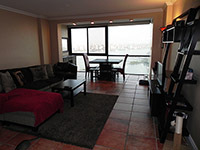 Direct NYC view, huge terrace with French doors! This elegant unit has sweeping New York City skyline views from the Empire State Building to the Freedom Tower and beyond, with unique custom French doors opening out onto a giant terrace from both the living room and bedroom. 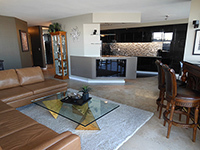 Apartment is beautifully upgraded with ceramic tiled living room, modern granite kitchen with honey maple cabinets, stainless appliances and breakfast bar; new AC units, and tasteful marble bath. Picture postcard ESB views plus terrace! Start spreading the news! Glittering NYC skyline and river vistas inspire and electrify as you enjoy balmy breezes and never-ending river action from your very own terrace high in the sky. This gorgeous apartment has beautiful new wood floors, new granite & stainless steel kitchen with cherry wood cabinets, new bath, good sized bedroom and plenty of closet space. Gorgeous unit! Stunning NYC views! 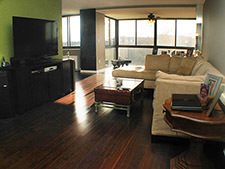 This beautiful, spacious apartment has drop-dead NYC views and deep, rich diagonally-set tiger oak hardwood flooring. Say “hello” to the Empire State Building from your 28-foot wall of floor-to-ceiling windows, framed by elegant see-through sunscreen shades; stay cool and comfortable with all-new AC units. Gourmet kitchen has large black granite counter, pendant lighting, new wood cabinets and high-end stainless steel appliances including Sub-Zero refrigerator, ultra-convenient drawer dishwasher, built-in cabinet microwave and stylish stovepipe range hood. Pristine, move-in condition! Spread your wings in this dramatic 820 sq. 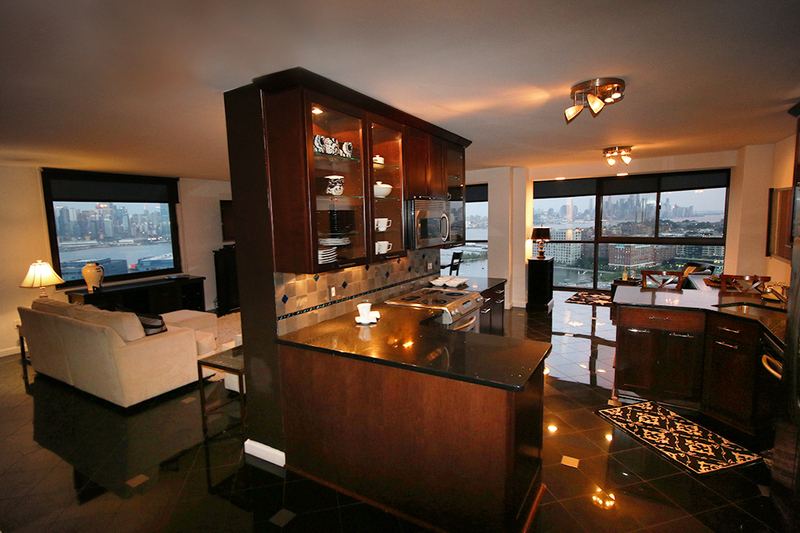 ft. apartment with breathtaking NYC skyline and Hudson River views. This gut-renovated 1-bedroom has an open loft-like feel with enclosed terrace and 28-foot wall of floor-to-ceiling windows. Beautiful black granite and maple wood kitchen has high-end stainless appliances; enlarged all marble bathroom has glass shower and all-new fixtures. Hidden wiring throughout. Mirrored living room wall doubles your stunning river and City views from the Empire State Building to the Statue of Liberty. 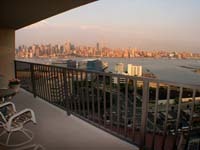 Huge terrace, fabulous panoramic NYC & Hudson River views! This lovely apartment has renovated kitchen with cherry wood cabinets and beautiful granite counters, hardwood floors throughout living area. New tile & glass bathroom. Enjoy spectacular sunrises and riveting river views from every room; take it all in from your giant 28-foot terrace. 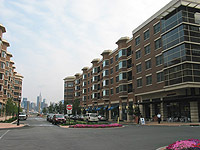 Great lifestyle in luxurious Troy Towers; easy NY commute! Enjoy the luxury of a top Gold Coast highrise and million-dollar New York City views, without the hassle of elevators or stairs! 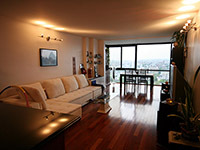 This lovely one-bedroom is beautifully renovated and conveniently situated on the lobby level of fabulous Troy Towers. The apartment has been tastefully redesigned throughout with sleek black ceramic tile floors, new California-style kitchen, custom lighting, spacious foyer, new tiled bathroom, and roomy bedroom with wall of bonus mirrored closets. Perfect starter apartment or pied-a-terre. Near mint condition; ready to move right in! Be on top of the world in this lovely sky-high unit with breathtaking views of the glittering Manhattan skyline and majestic New York Harbor. 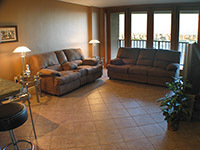 Enjoy it all from every room, or from your giant 28’ private terrace! Renovated kitchen features maple wood cabinets and paneled Sub-Zero refrigerator, all stainless steel Bosch dishwasher and Frigidaire smooth-top range/microwave. Living area has beautiful oak wood strip floors; all new bathroom has tasteful stone tile, frameless glass shower, all new fixtures. Great unit! 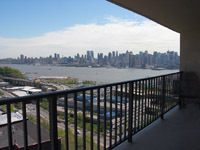 Huge terrace, panoramic NYC view! Move right in to this beautifully gut-renovated apartment with huge terrace and spectacular NYC views. The look is clean and serene, with new light wood floors throughout, black galaxy granite and maple wood kitchen with stainless appliances, and elegant new tile bathroom with glass shower and wenge vanity with glass vessel sink. Apartment features all new interior doors, crown moldings, new double-pane windows, new AC units. This elegant apartment sits near the pinnacle of lovely Troy Towers, with sweeping panoramic views of the entire Manhattan skyline and Hudson River vistas. 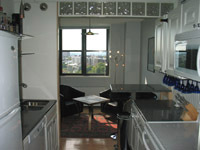 This recently renovated unit features granite, wood, and stainless steel kitchen, all new bath and new picture windows. Entry foyer has been opened up for a roomy, spacious feel. Terrace can be enclosed to add another 100 interior sq. ft. if desired. This huge, sunny corner unit offers the perfect blend of warmth, sophistication, and breathtaking drama with its 27’ wall of floor-to-ceiling windows and panoramic NYC views from the GW Bridge to the Verrazzano. Oversized gourmet kitchen features cherry cabinets, tumbled marble backsplash, granite counters with breakfast bar, stovepipe range hood, Jenn-Air down draft grill, stainless appliances and Viking wine cooler. Ceiling fans and ample woodwork provide a warm touch; designer bathrooms and seven roomy California closets complete the picture. Stunning view, huge terrace, great value! 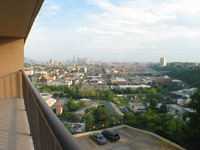 Enjoy spectacular unobstructed river and skyline views from this choice location in fabulous Troy Towers. This charming unit has separate kitchen with pass-through window, wood plank floor, and updated cabinets and appliances. Living area and bedroom have new wall-to-wall carpeting and new heater-A/C units. Beautifully modernized, this generous 925 sq. 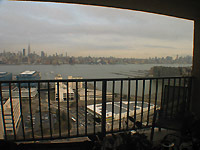 ft. apartment includes huge living room, separate dining area, and separate glassed-in sun room with panoramic Empire State Building, GW Bridge, Weehawken reservoir, and Ramapo Mountain vistas. Apartment has tasteful white ceramic tile floors throughout, new bathroom, and custom white laminate cabinetry that coordinates from the kitchen to the dining area, hallways, and bedroom built-ins. All closets are customized with California-style drawers and shelving. Kitchen is all white with coordinated white Sub-Zero and GE Profile appliances; beautiful marble-like Corian counters and breakfast bar in the dining area. 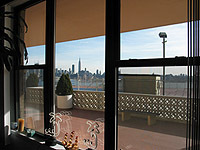 Sunny, spacious, stunning NYC views! This apartment is gorgeous! 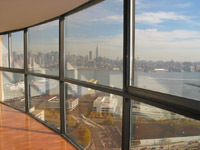 28' wall of floor-to-ceiling windows showcase the spectacular NYC skyline, Hudson River, and NY Harbor/ Verrazzano Bridge. Beautiful granite and cherry wood kitchen with state-of-the-art stainless steel appliances, two new granite/tile baths, custom closet interiors, crown moldings everywhere, and gleaming off-white porcelain tile floors throughout living area with contrasting, elegant hardwood in bedrooms. Triple mint! 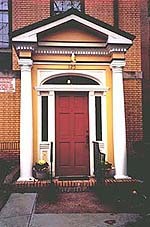 most desired 2BR line in Troy Towers! This gorgeous apartment is completely gut-renovated and situated sky-high in the most desired corner of Troy Towers. Dramatic wall of floor-to-ceiling windows and sliding glass door open onto huge glass-paneled terrace with stunning, unobstructed views of the entire NYC skyline from the George Washington Bridge to the Verrazzano. All-new granite kitchen, marble baths, walk-in closets, huge master bedroom and sunny southern as well as bright eastern exposure. 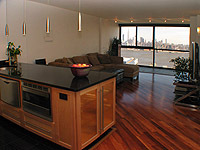 Raise the remote-controlled shades on your wall of floor-to-ceiling windows and watch the sun rise over breathtaking, panoramic New York City skyline views from the Empire State Building to the Statue of Liberty and beyond; then savor every sunset over wide open New Jersey city and mountain vistas. 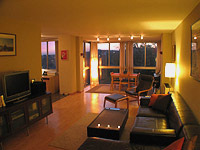 This extra-sunny, ultra-high-floor corner apartment features stylish upgrades including professional media wall with recessed lighting, sleek ceramic tile floors punctuated with earthy stone veneer wall treatments, and designer bathroom with woodgrain thermofoil surfaces and Origami air jet tub. Tasteful touches everywhere, including wheatgrass wall coverings and lighted Shoji-style custom closets. Private mirrored "gym" easily transforms back to second bedroom or home office. This elegant unit is lovely and immaculate; move right in! Huge terrace overlooks lovely lawns, pool and patio, keeping you grounded with greenery while enjoying picture-perfect New York City & harbor views from twenty stories above the river. This roomy apartment features all new double-pane windows, closets everywhere, wood parquet floors. Ready for your designer touch...just bring your creativity! 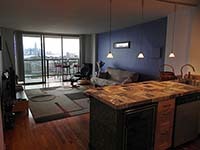 This unique and affordable 3-room studio/junior 1BR makes the perfect pied-a-terre or starter apartment, with large separate bedroom, lots of closet space, and small separate living/sitting area. This pristine apartment has been totally gut renovated from top to bottom, including maple strip floors in the hallway and living areas, black granite tile in the 8 foot chef's galley kitchen with all new appliances and cabinetry, new bath, and designer lighting throughout, and separate computer nook. 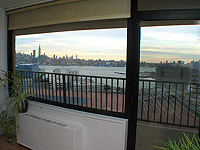 This apartment is very quiet, with sunny, open views of NY Harbor, Statue of Liberty, and stunning sunsets. Finally, a home-sized apartment - at 925 sq. ft., you've got room to roam and a place for everything! Huge, beautiful, sun-flooded, fully renovated apartment with separate dining area, enclosed terrace, all new wood floors, new kitchen & bath, closets galore! 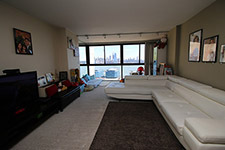 Downtown NYC and river views, very bright and airy, immaculate! Breathtaking, wide open NYC skyline views abound from the wall of floor-to-ceiling windows and sliding glass doors that open onto a huge open glass-paneled terrace. This lovely 1BR has new wood parquet floors, lots of closets, and upgraded windows. Priced perfectly to allow for your designer touch. Polish this diamond! Endless views...and closet heaven! This extra-large 1BR has an eat-in kitchen, all new windows, and huge open terrace. 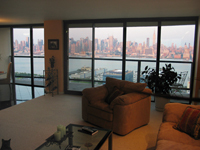 Giant picture window in living room frames magnificent views of midtown and upper Manhattan, Hudson River marinas, George Washington Bridge, Weehawken Rreservoir, and mountain vistas. One of the largest 2BR/2bth layouts in Troy Towers, this renovated beauty boasts over 1450 square feet of luxury living space and wall of floor-to-ceiling windows overlooking the entire Manhattan skyline. This big corner unit boasts Empire State Building views from every room! New granite kitchen and bathrooms, seven closets. Troy Towers - Apt. 1012 "Before"
See the Empire State Building from every room! Magnificent New York City skyline and NY Harbor views abound in this sprawling, sunny apartment, one of the largest floor plans in Troy Towers. All new windows, eight roomy closets, two full baths, large entry foyer, huge living room, separate dining area, and a huge southeast-facing private 28' terrace, which can be enjoyed for year-round fresh air or enclosed in glass, bringing this big apartment up to a giant 1475 square feet. Specially priced to allow for your tender loving care and designer touch. Troy Towers - Apt. 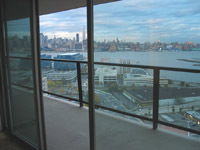 1012 "After"
Panoramic views of Hudson River and NYC Skyline! The views will take your breath away! Enjoy every sunrise, sunset, and magnificent New York City skyline and NY Harbor views from this sprawling 2BR, 2Bth corner apartment. This spacious and sun-flooded gem offers 28-foot wall of floor-to-ceiling windows, full eastern and sunny southern exposure, large entry foyer, two all-new bathrooms, large separate dining area, loads of closets, and beautiful brand-new hardwood floors throughout. Brilliant southern light and panoramic downtown Manhattan, NY harbor and Statue of Liberty views abound from this giant 940 sq. 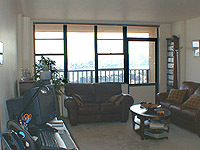 ft. 1 bedroom, 1 bath apartment with extra-large kitchen, separate dining area, and private home office. Huge new kitchen features cherry wood cabinets, gleaming blue/black granite counters, stainless steel appliances and white porcelain tile floors. Apartment has all-new maple hardwood floors and baseboards throughout, five roomy closets, and a stunning Euro-styled all-marble bath. An incredible value! Troy Towers - Apt. 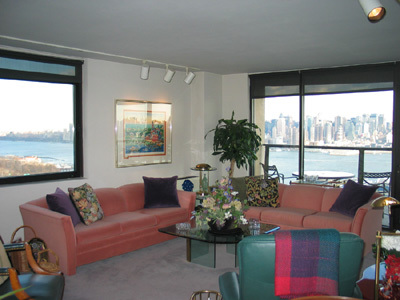 2001 "Before"
Enjoy gorgeous, panoramic 270-degree views of mid-upper Manhattan, GWB, NJ mountains and sunsets from this extra-large corner terraced apartment. 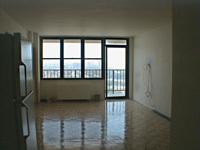 Very clean unit with new wood parquet floors, new windows, more closets than any other 1BR in the building! Great value, priced to sell quickly. Bring your creativity...and binoculars! Troy Towers - Apt. 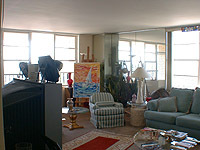 2001 "After"
Troy Towers - Apt. 1908 "Original"
Touch the sky! Grab your George Foreman and invite the friends for fireworks, from your enormous, east-facing 150 sq. ft. terrace. This rarely available, high-floor "8 line" center apartment is perfectly positioned for total privacy and 100% unobstructed, drop-dead NYC skyline and Hudson River views. Neat as a pin and ready to move in, with updated kitchen and bathroom, wall-to-wall carpet. Troy Towers - Apt. 1908 "First Renovation"
Dramatic floor-to-ceiling windows showcase panoramic NYC skyline views from this choice 1BR/1Bth that also has a den/guest room/home office. Beautiful black granite and light maple kitchen, new hardwood strip floors throughout. Price includes new paneled doors, tile kitchen backsplash, and brand-new tile bathroom...hurry to input colors & materials! 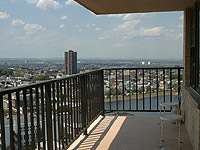 Troy Towers - Apt. 1908 "Second Renovation"
Coveted "08" line, unobstructed NYC view! Step into this loft-like beauty with enclosed terrace and floor-to-ceiling windows, and be blown away by the stunning, panoramic NYC skyline views magnified to the max by a dramatic wall of sparkling mirror. This sky-high home is perfectly situated dead-center in the arc of the building, providing total privacy and unobstructed, breathtaking City, river, and harbor views. 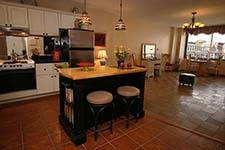 Beautiful black granite and maple wood kitchen, new wood floors throughout. Nothing short of spectacular! 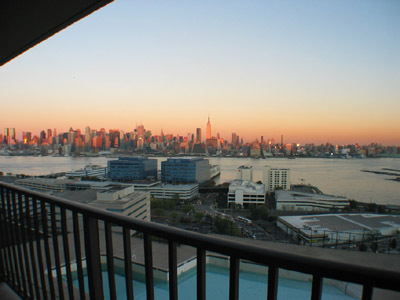 Drop-dead gorgeous NYC skyline views, totally unobstructed, from the GWB to the Statue of Liberty. 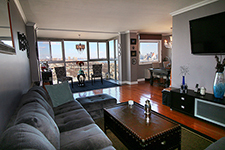 This rare and beautiful high floor, corner unit in fabulous Troy Towers has a 150 sq. ft. glass-panelled terrace, floor-to-ceiling windows in huge living room, large separate dining area, updated kitchen, and two renovated tile bathrooms. Parquet floor in living area, bedrooms have wall-to-wall carpet. All new double-pane windows and new heat/AC units with thermostatic controls. Maintenance includes ALL utilities and is 45% tax-deductible. Won't last...call now! 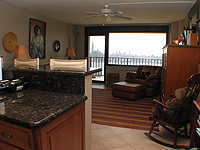 Fabulous direct NYC and Hudson River views from your private terrace high in the sky! Beautiful 1BR apartment in luxury hi-rise building with pool, garage, gym, concierge, central air conditions, and laundry on every floor. Maintenance includes ALL utilities! Spread your wings in this dramatic 800 sq. 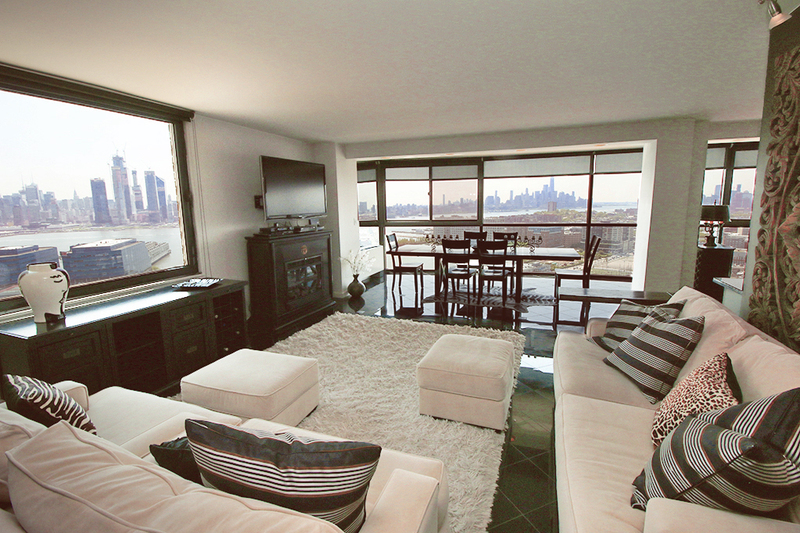 ft. mini-loft with breathtaking NYC skyline and river views through it's wall of floor-to-ceiling windows. High-end gut renovation with marble floors throughout, built-in plasma screen HDTV's, granite gourmet kitchen, built-in closets, French doors from bedroom to glassed-in sunroom. The world is yours! 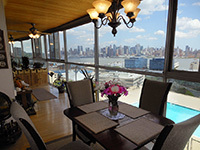 Spectacular, NYC skyline and Hudson River views from floor to ceiling wall of windows. This rarely available, high-floor "8 line" center apartment is perfectly positioned for total privacy and 100% unobstructed drop-dead views. Drop-dead gorgeous! This absolutely stunning, huge, sunny 1BR has been gut-renovated and lovingly decorated throughout, with state of the art wood and stainless steel kitchen, designer bath with steam shower, new oak hardwood and porcelain tile floors, custom wood closets with frosted glass doors, separate dining/home office area, floor-to-ceiling windows with sliding glass doors onto sunny, south-facing terrace. Must see! Perfect view and perfectly affordable! 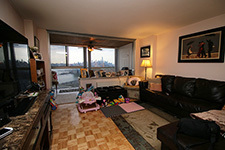 High floor apartment with large open terrace and direct midtown Manhattan/Empire State Buiding view. Updated kitchen & bath, new appliances, ceramic and wood parquet floors, mirrored closet doors throughout. Direct eastern exposure; sunny & bright. Building has beautiful new lobby. Move right in to this beautifully renovated 850 sq. ft. apartment with master bedroom plus small second bedroom/guest room/home office. 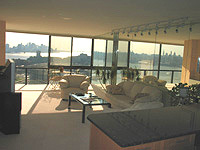 Apartment features floor to ceiling windows with breathtaking, panoramic NYC skyline and river views. Ceramic tile floors, new eat-in kitchen, berber carpet. Pristine, move-in condition! Savor a taste of heaven in this extra-large, 775 square-foot 1-bedroom apartment with breathtaking 270-degree views from its rare, open 25' corner terrace. This south-facing, very high floor apartment enjoys sunrise, sunsets, and picture-perfect city, river, and mountain panoramas. Taste all the City has to offer and come home to peace and tranquility in this charming one-bedroom apartment in luxurious Troy Towers. Step onto your private terrace, enjoy breakfast or cocktails and sweeping New York City and Hudson River views from your choice vantage point high above the river. 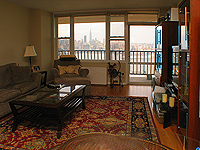 Empire State Building is dramatically framed in giant living room picture window. 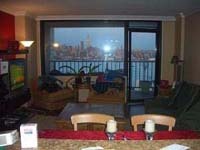 2BR/2.5BthLuxury waterfront duplex, NYC view! 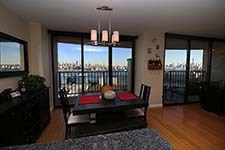 Located just north of the NY Waterway ferry terminal at Port Imperial, this rare & affordable waterfront duplex in gorgeous Grandview at Riverwalk is nearly 1600 square feet of Brazilian cherry hardwood floors, diagonally set to show off its opulant space, high ceilings, and stainless steel and black galaxy granite kitchen. This unit has a large private balcony overlooking a lovely pool and garden greenery, plus the entire living area and master bedroom face directly east with views of midtown Manhattan and the Empire St. Building. It's the perfect blend of city glamour and a homey townhouse feel, with private bedrooms with walk-in closets and separate full baths upstairs, huge loft-like living/dining/open kitchen & guest bath downstairs. Includes one deeded garage parking space on-site. Best 1BR value in Doric! This large & lovely high-floor apartment is quiet, sunny...and fully furnished, if needed! Has renovated kitchen and beautiful new bath, separate dining area, wood parquet floors, and lots of closets. 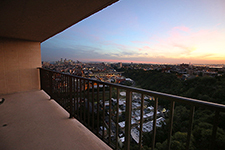 Private balcony affords panoramic views of the GW Bridge, upper Manhattan, NJ treetops, mountain vistas, and fabulous sunsets. Maintenance includes "everything!" 10% down acceptable. 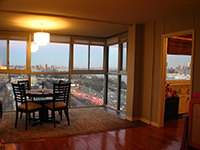 Stunning NYC view - largest 1BR in Doric! This sprawling penthouse floor beauty has panoramic NYC skyline views and has been totally and lovingly gut renovated, with Brazilian cherry wood floors throughout. Kitchen wall has been opened up to create a spacious loft-like feel, with modern stainless and glass suspended range hood, stainless appliances, beautiful granite counter top, dramatic track and under cabinet lighting. Bathroom features all new fixtures including vessel sink, recessed lighting, and Jacuzzi tub. 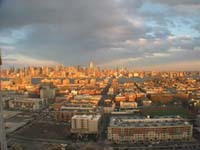 Super convenient commute to NYC and Hoboken, with quick access to bus, Light Rail, and PATH.. Maintenance includes "everything!" 10% down acceptable. 3-4BR/2Bth Rare opportunity! All the charm of a bygone era awaits in this spacious, sunny seven-room Victorian condo, situated in Jersey City's lovely Lincoln Park section. This unique 4-story turn-of-the-century house includes private off-street parking and a beautifully landscaped backyard garden. Enjoy the peace and quiet from your top floor home with high ceilings, hardwood floors, 3BR's with a possible 4th, and two full baths. North, south, east and western exposures provide plenty of natural light, plus full open views of Lincoln Park, neighborhood treetops and charming row houses. Pet-friendly, investor-friendly, easy Board approval, unrestricted sublet policy! This charming prewar Art Deco-styled building has video security, elevator, a huge common patio, and superintendent and laundry on the premises. This roomy studio features high ceilings, prewar details, hardwood floors, separate entry foyer, dressing room, windowed kitchen & bath, and lots of closets. 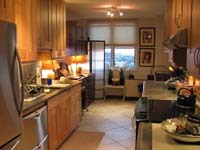 Located in desirable Gramercy Park/Kips Bay area; walk to restaurants, transportation, shops, Village, and Flatiron.